Join the email list for your city to receive updates on future WSO events in your city. When signing up you will also receive a welcome email with a link to join your city's chat group. We created these Telegram groups with the goal of making it easier for WSO members to organize events / happy hours. can you pm the links for the London and new York groups pls. What about Amsterdam or Rotterdam? Why not use Telegram? It doesn't have the 250 participant limit. Because bankers, by DNA, are technologically inept. Slack? It's an app you'll have to use in most offices anyways. Must be fun in London's group. Singapore is quiet though. I'll wait till the weekend arrives. Coming soon based on Top 50 cities that we don't have covered yet! I'd like to join Kuala Lumpur group. Can't wait! Is there a group for Toronto ? Is there a group for Toronto? Looking forward to joining pittsburgh! The Captcha is all screwed up for me. I tried multiple browsers and it's still cutting off the top boxes... just a heads up. Can you send the link for Atlanta? I completed the form but never received an email. Any thoughts @AndyLouis ?? somehow the verification pic will not load all. I only saw 2 rows of pictures with no text mentioned what should I select. Anyone experience the same? I have not received the follow-up email either... any suggestions? cannot find whatsapp group for hk? is there someone who can send me the link?? HK is on the dropdwon in the original post, did it not work for you? still cannot find it could you please give the link? I don't see St. Louis on the list, any interest in starting a group here? guessing it would be a smaller group. would be very interested if we combined KC and STL into 1 group. That would work, and if it grows they could be split out. if there are enough Bulgarians on the site to be honest. Could you add Mexico City? Join the email list for your city to receive updates on future WSO events in your city. 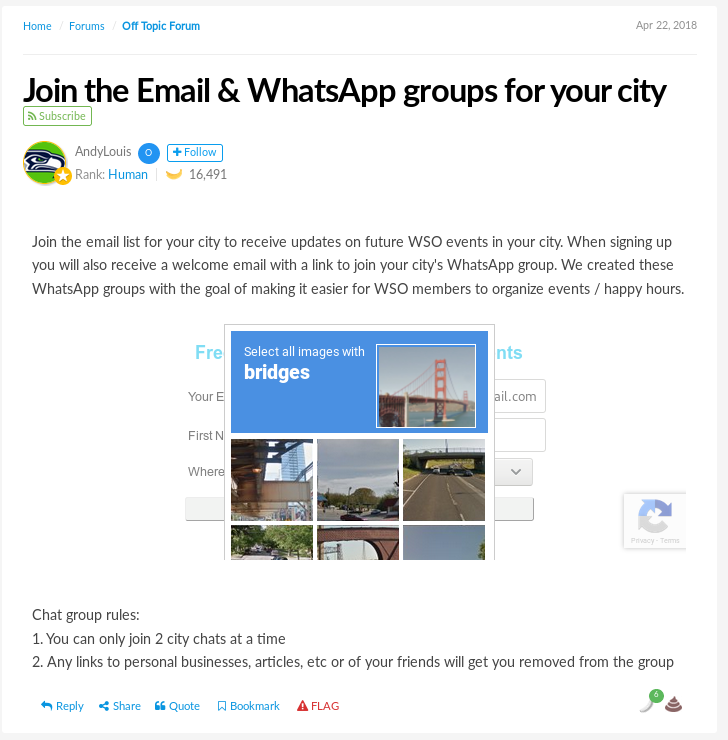 When signing up you will also receive a welcome email with a link to join your city's WhatsApp group. We created these WhatsApp groups with the goal of making it easier for WSO members to organize events / happy hours. Tell whoever does your webdev stuff, that the "bodyContainer webFormBodyContainer"'s gotta go to 500px height on Captcha open, for a quick fix. Ever consider using Discord? It has voice chat functionality. Can you link me to Austin, TX? Not receiving an email. Thanks! London seems to be full. Is there an alternative? Anyone know where the Chicago group is meeting tonight? Hi guys, is there any active group for Madrid - signed up to the email list but it seems that the whatsapp has been revoked ? Hi, could someone please send me the link to the London Whatsapp group? The link I received via email seems to have been revoked. I am looking for the Chicago link as well. Can someone please PM me the WhatsApp link for New York? I signed up but never received the link in my e-mail. Thanks!!! I joined mine (Toronto) and there are 200+ people are in it, but no one has said a word. It's somewhat unnerving, but I suppose I am part of the problem until I say something. Andy could you please add me to the NYC group? Thank you!!! I see Stockholm, what about Copenhagen or a Scandinavian group? Anything for Connecticut? Around Stamford? I am not in finance or banking but joined this site because at the time I wanted to be in IB, still thinking of an MBA a couple years from now. Think someone in an unrelated industry could join or is it mainly high finance, bankers, and finance in general only? Would love to get a Miami group going! Could someone add me to Chicago group? Thanks! I am willing to help host and organize events in Dallas & Austin - WSO admins, feel free to reach out. How can I be added for Dubai please? Can anyone send me the link for Washington, Raleigh, Durham, Chapelhill, or Richmond, VA, and Atalanta please? I can travel and commute to all of theses cities, and I am worried that some of the cities listed below might not have a group. Can I get the one for Frankfurt and London please, thanks. Hey! Could you send me the London one?